Talcum powder is made from talc, a mineral made up mainly of the elements magnesium, silicon, and oxygen. 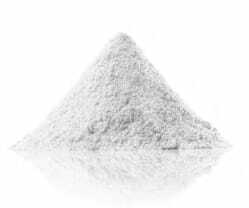 Talc, hydrous magnesium silicate, is a soft mineral used in food, drugs, cosmetics and industrial applications. Cosmetic-grade talc is produced so that it conforms to United States Pharmacopeia (USP) and industry speciﬁcations. Talc can be crushed into a white powder that is widely known as "talcum powder". This powder has the ability to absorb moisture, absorb oils, absorb odor, serve as a lubricant and produce an astringent eﬀect with human skin. These properties make talcum powder an important ingredient in many baby powders, foot powders, ﬁrst aid powders and a variety of cosmetics. Talc has many uses in cosmetics and personal care products including as an absorbent, anti caking agent and to improve the feel of the product. Talc is approved by the Food and Drug Administration for use in ingested and topical drug products. The Food and Drug Administration has determined that talc is Generally Recognized As Safe (GRAS) for use as an anti-caking agent in foods. It is also permitted as an anti-caking agent in vanilla powder. FDA has listed talc as a color additive that may be used in coloring drug products and as a component of colors for use in drugs and cosmetics.